SGR protection ring channels electrical current away from motor bearings. 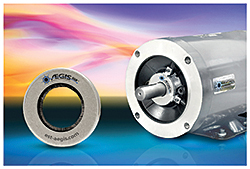 Available in standard sizes to fit AC motors from 1 to 1,500 HP with shaft diameters from 8 mm to 153 mm. Larger sizes are available for shafts with greater than 6-inch diameter. Screw-on mounting brackets require no machining.